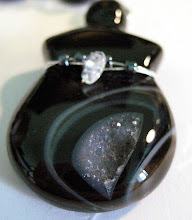 I have no aspirations to be a food blogger -- I love making jewelry too much. But once in a while it's fun to share a recipe. Be warned, though, I don't do measurements, but instead cook by feel, so these measures are approximate. If you are an experienced cook you'll have a feel for the amounts that seem best to you. Fresh mozzarella cheese has to be one of life's gifts. Well, cheese in general is. I like to buy mine at Costco, where you can get a nice size block for about $5. - Cut sticks about 1/2" to 5/8" on all sides, and about half as long as the width of the block of cheese, depending on the size of the block. Cut enough for about a dozen sticks. 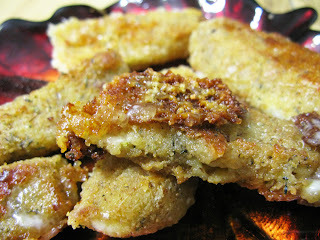 - I probably use about 1 1/2 C bread crumbs (you can use corn meal, too, if you like. Pour your oil into your skillet (if you have a fryer, all the better, frankly) and heat on very low, just to warm up the oil so that it takes less time once you're ready to start frying. DO NOT use olive oil. Olive oil has a low flash point and cannot cook these as quickly as you need for them to cook, which is why using a fryer is really optimal. Beat 2 eggs by hand in a shallow bowl. Let rest for a minute, and while the eggs are resting, pour your bread crumbs onto a paper plate, or whatever you like to use for breading. Add your Italian herbs and pepper to the bread crumbs and mix. 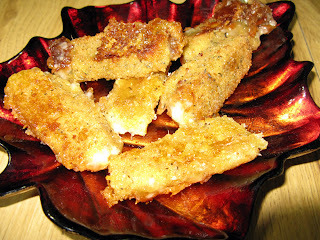 Transfer the cheese to the bread crumbs and coat well, patting a bit if needed for it to stick. Dip into egg again and then bread crumbs. 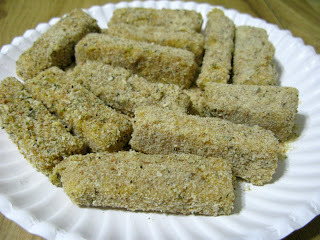 I put the finished sticks onto a plate that has been dusted with bread crumbs. Heat oil to a high temp, though not so high that the oil reaches its flash-point, and then transfer sticks to the pan, half at a time. Fry quickly, so that all the cheese doesn't have the time to run out and you're left with basically cheese-flavored breading. When the sticks are brown, transfer them to a brown bag or paper towels to drain for a minute and sprinkle your garlic salt over them, both sides. 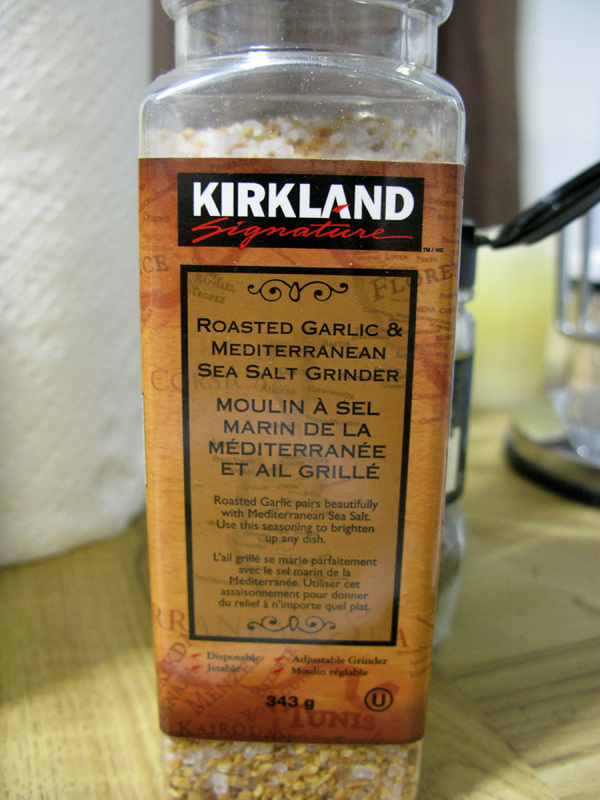 I love Costco's Kirkland Signature brand Roasted Garlic & Mediterranean Sea Salt Grinder. 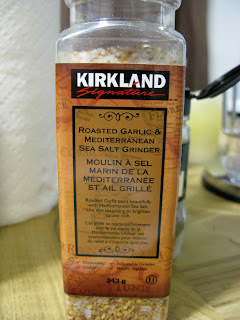 It grinds up the salt and the pieces of dried roasted garlic together. So I grind some of that on at the end. I don't like to put it in the bread crumbs. because garlic can become bitter when fried, so I find it works out better that way. You can also grate some Asiago cheese on top, too. If you want to have them all hot at the same time, you can either use two pans, or do them in two batches, putting the first batch on a pan in the oven set at about 180-200 degrees or so. These are great dipped in marinara sauce, honey mustard dressing, bleu cheese dressing or ranch dressing. 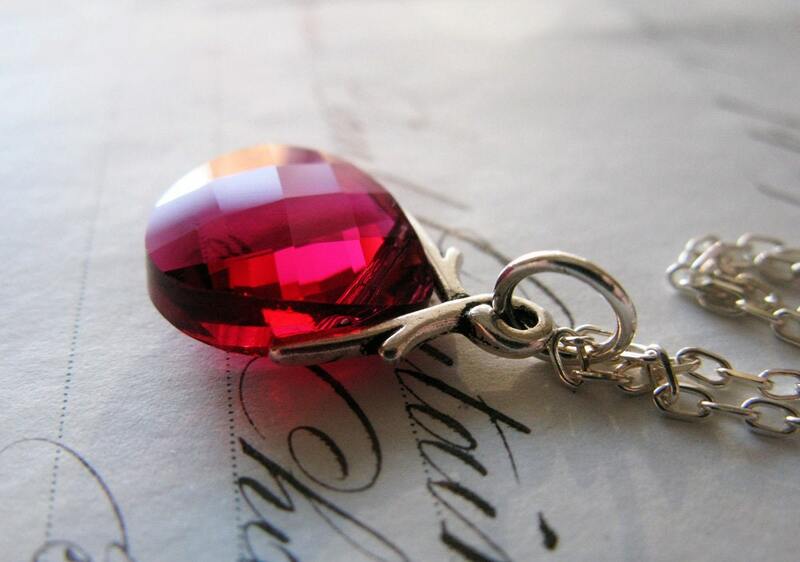 Thank you to Megan of Etsy Bride for featuring our Garnet Red Bridal Necklace in her fabulous blog. I sometimes take a peek at what she's doing over there, because she always puts together great items and color schemes. 2010 was a year full of ups and downs for us: my son and I not living so far apart, which is wonderful beyond words and has allowed us to design jewelry together more often; starting a successful new business venture (Fallen Angel Brass®) with a friend; the collapsing health of a loved one; problems with my own health; moving over the holidays, and other assorted wonderful and not so wonderful happenings. All in all, I'm wishing for all of us that we enjoy good health, friendship and love in our lives, rich working and/or business lives, personal fulfillment, burgeoning financial success and more. Their look has changed but the important stuff is still the same! Thank you, Heather, and thank you to those of you who go over there to read and comment! Congratulations to Stacey -- your baby has brought you luck! The winning number, chosen by random.org, between one and 2008, is 221 and Miss Stacie chose 225. As outlined in the rules, it doesn't matter if the person has gone over, it's about who is closest and Stacie couldn't have gotten much closer without hitting it on the head! So Stacie, please message me with your address and the next time we go do mailing your English Garden earrings will be wending their way across the pond. Join us on our FB page! Dusting off the blog for an announcement! Keep up with Adorn Me jewelry's new designs as they're added.